It looks as if AMD is beginning to be more open about their GPU technologies, and further in advance than has been tradition. This is a marked difference from the general attitude that seemed to be adopted in the past. GPU’s and everything associated to them has always been under very tight wraps. But Raja Koduri is leading the new Radeon Technologies Group and has duly noted that the lack of transparency and openness might have been a cause of contention between consumers and AMD’s products. The attitude seems to have shifted almost drastically since the forming of the RTG, moving towards an internal business model that’s significantly more transparent. A welcome change indeed. 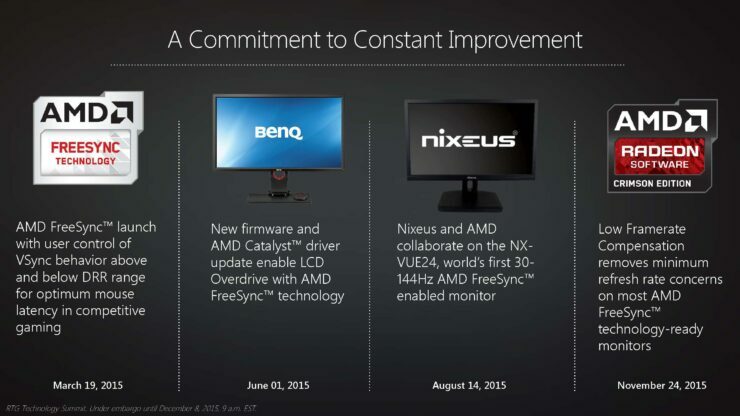 We’ve already discussed the changes that AMD wants to bring to display technology and how better pixels are coming. 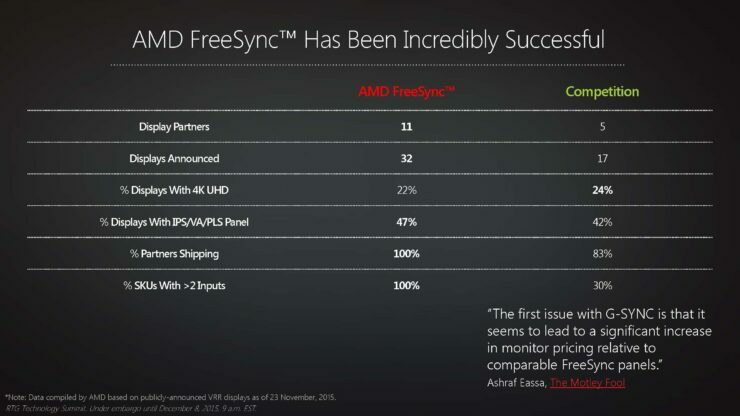 But now let’s look at their plans for FreeSync in 2016. HDMI 2.0 finally coming to AMD GPU’s in 2016, and FreeSync is becoming more affordable. AMD’s FreeSync hasn’t quite had the consumer adoption that they might have wished for, despite having an open standard and there being far more choices of available monitors that sport FreeSync integration. Perhaps that’s the result of being a bit later to market. But they’re marching on and moving forward with changes that leverage the open platform that they’ve committed to to provide a better viewing experience with appropriately equipped monitors. 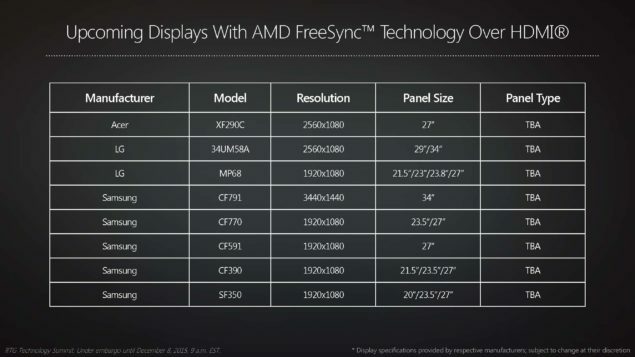 The numbers look fantastic for AMD, however. More monitors announced, and shipping, with an open platform that allows more than one input and allows for innovation without the need for additional hardware. It’s the openness that’s really to their advantage. 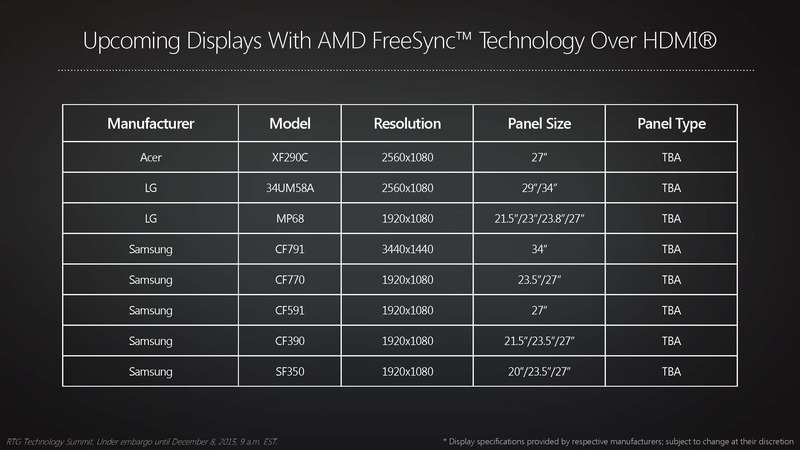 And there are new changes coming for 2016, ones that are going to use evolving technologies, and current ones, to make FreeSync more available. 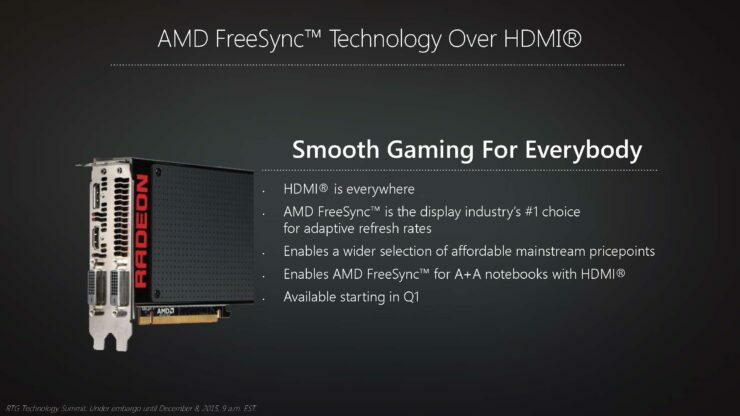 That’s an issue that has been touched upon in the past, by both AMD and NVIDIA. 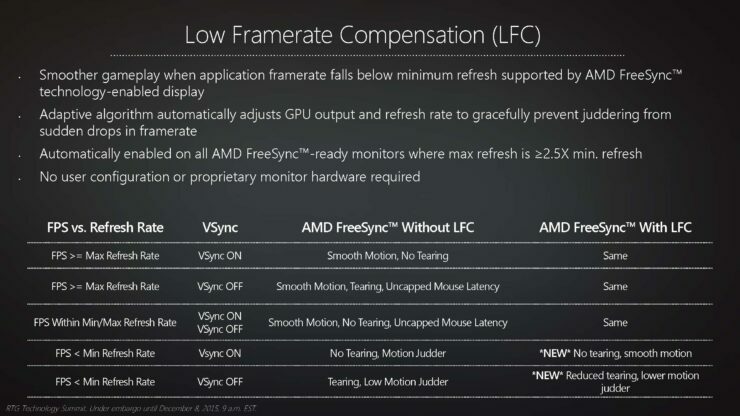 How to let more people enjoy variable refresh rates, and especially higher refresh rates. 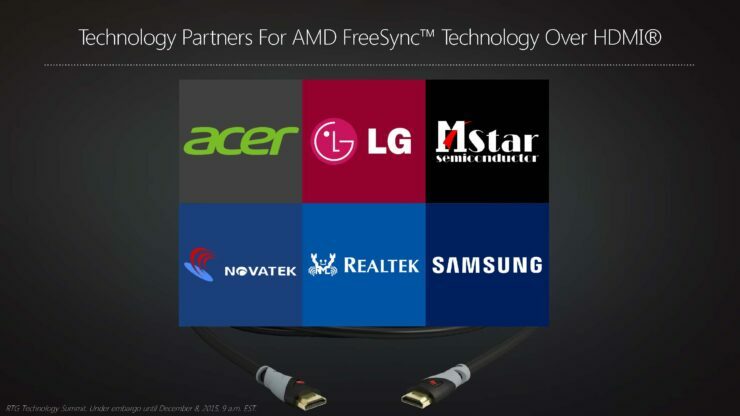 FreeSync over HDMI is now official, and should be available starting Q1 of 2016. Dynamic, and most importantly for gamers, higher refresh rates will all be supported over HDMI. They’ve been able to do this by adding in a vendor specific specification to their GPU’s, which can use any HDMI standard to work. 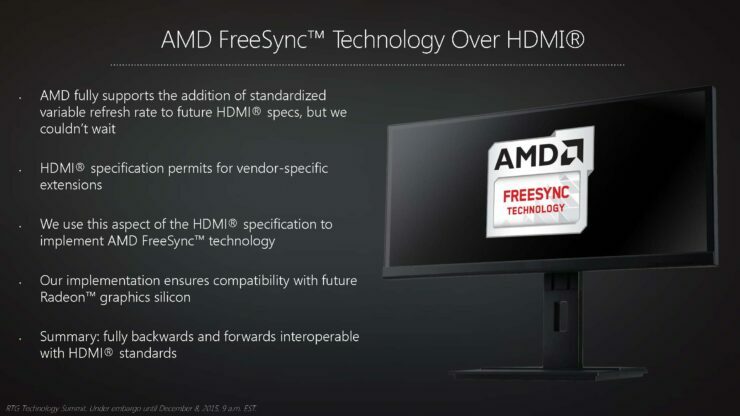 Idealy, and for bandwidth reasons, HDMI 2.0A is the best, though current Radeon GPU’s don’t support that, so FreeSync over HDMI is backwards compatible as well. There are going to be a number of displays coming from the various partners in 2016. None of them are 4K as of yet, but the bandwidth needed for 120Hz and that resolution easily exceeds the bandwidth provided by HDMI 1.4. This is more of a mainstream and lower cost solution, though it fully supports Low Framerate Compensation as well as anything else that AMD might put into their FreeSync specification (which itself is driven by VESA’s Adaptive-Sync standard). Furthermore, DisplayPort 1.3 and HDMI 2.0a support is coming in 2016 with their upcoming as-of-yet officially unnamed 2016 Radeon GPU’s. DisplayPort 1.3 isn’t a new standard, having been announced in 2014, but it hasn’t really been seen in the wild as of yet. 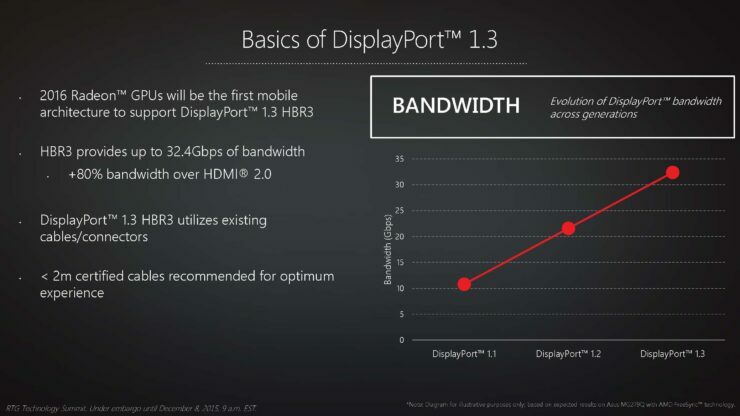 DisplayPort 1.2 is going to add High Bit Rate 3, which will increase the bandwidth available to 32.4Gbps, enough to drive even higher resolution displays at higher refresh rates. 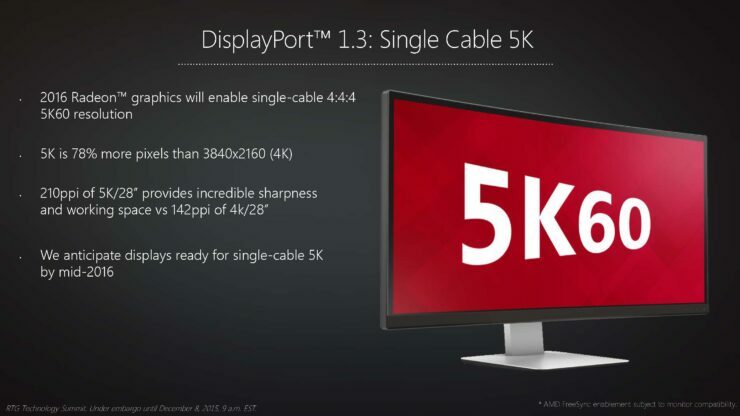 We’re talking about enabling 5K resolutions at 60Hz with a single cable. 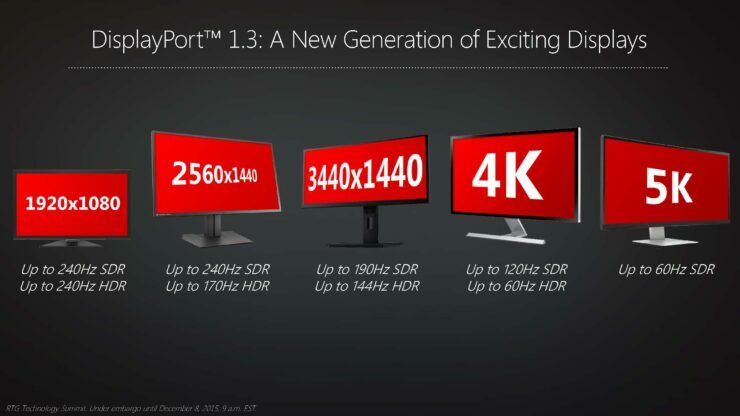 And the cables that DisplayPort 1.3 will use are the exact same as with DisplayPort 1.2, though the higher quality the better.All of that extra bandwidth is absolutely necessary if they’re going to truly capitalize on their dreams of bringing HDR to consumers. 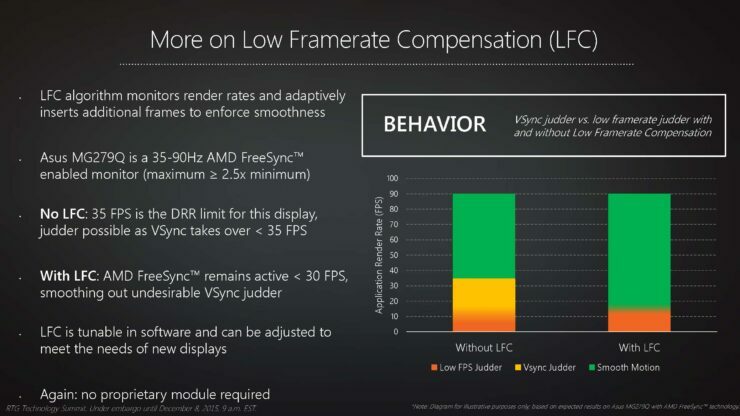 It’s also necessary in order to have their Low Framerate Compensation technology available, which requires a max refresh-rate that’s 2.5x the minimum refresh rate in order to work properly. 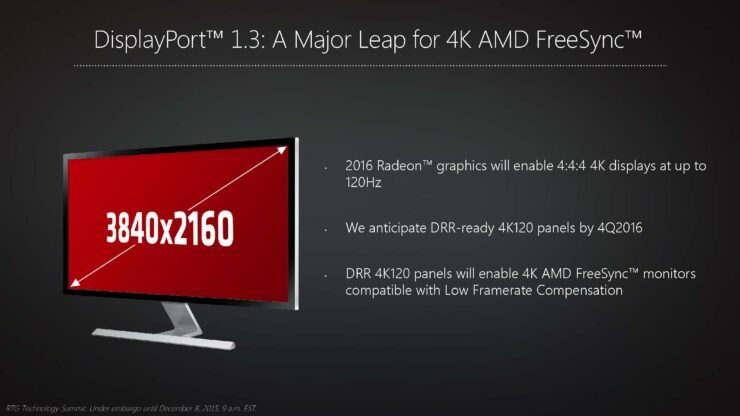 It’s absolutely fantastic to see AMD finally embrace HDMI 2.0, especially because the standard is actually quite old now. It was odd not seeing it with the release of Fiji, but we’re at least guaranteed to have it part of the 2016 Radeon GPU lineup. 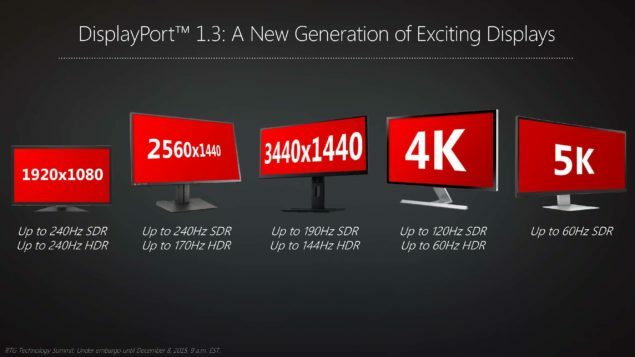 This makes perfect sense given the push for HDR and the fact that HDMI 2.0 brought with it the next-generation BT.2020 color space, 4:2:0 chroma sampling, and support for true HDR video, not to mention the increase in bandwidth to be able to drive increasingly higher resolutions.